The Snoopy Labyrinth had a very providential beginning. In January of 2001, I was invited by the Luther Burbank Home & Gardens to give a presentation on labyrinths. We set the date for later in the year, way out into the Fall. The date we chose was Tuesday, September 11th. Following the events of that tragic morning, the LBH&G called me up and wondered if we should cancel that late afternoon's event. No, I said, if one person showed, we would need to go forward and give what support we could. As it was, twenty-four people attended. One of those attendees was Jean Schulz, the widow of cartoonist Charles Shultz and the Peanuts Gang, and her director for the new Charles M. Schulz Museum & Research Center that was being built in Santa Rosa, CA. Ms. Schulz was looking for something archetypal to tie the museum and grounds to the surrounding community. She asked me if I could make a labyrinth in the shape of Snoopy's head. Of course, I responded! Our original plans for the Snoopy Labyrinth was to be small. We initially thought maybe twelve by fifteen feet? The final project ended up being approximately sixty-five by seventy-five feet! 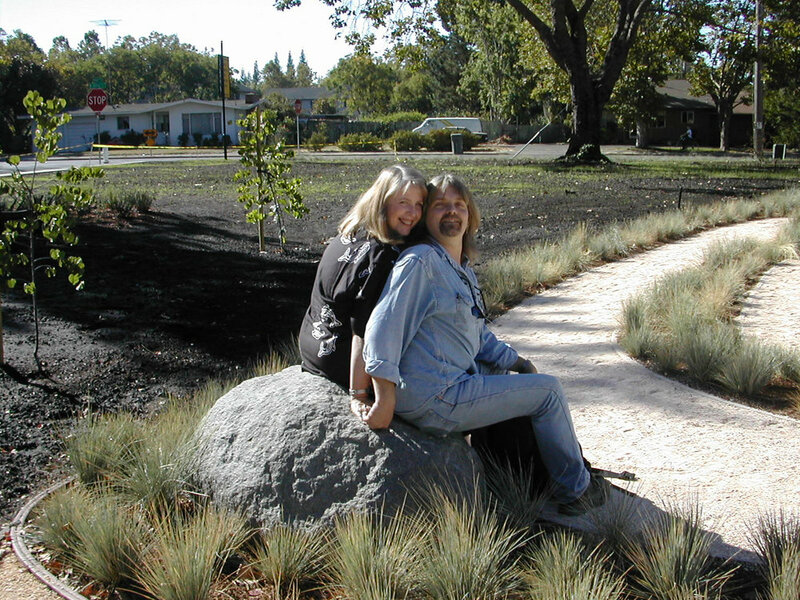 This was my first project working with landscape architect John Northmnore Roberts of John Northmore Roberts & Associates, in Berekeley, CA. There were lots of moving parts to the layout of this design: the installation of plantings, the path surface material, rocks, customized benches of local stone, and Snoopy's nose, which is a two-ton granite boulder from the Mother Load, of the Sierra Nevada of California. And after it all came together, it was wonderful to watch both children and adults enjoy this unique iconic labyrinth! John Robert's said, "what better way to get inside the genius imagination of Charles Schulz, than to walk inside one of his creations!" Here are some of my photos from my Snoopy's Nose collection of family, friends, and labyrinth colleagues!